The characters- I liked Lynn she was resourceful, had a good head on her shoulders and her personality was likable. My problem is I felt we could've learned more. Everything felt sort of superficial. I wanted to dig deeper and was never rewarded with more than just the top layer of her personality. I also would of liked to learn more about Stebbs. He seemed to genuinely care for Lynn and her mother since he stayed by them all those years. I kept expecting a twist in his story but by the end I knew what I was hoping for wasn't to be. Lastly, I really wish we could of learned more about Eli. When events happen later in the book I didn't really care. I hadn't formed any emotional connection with his character so the impact of what takes place didn't really matter to me. The World Building & Pacing- Here's the thing Not A Drop To Drink actually has some solid world building in parts. However, this wasn't carried throughout the entire book. Some bits of information are dropped by the wayside while other more trivial bits seem to have to much focus. Also from start to finish this book felt rushed. Why bother mentioning a city and then not show it? Why bother mention water shortages and then not make it feel like this was actually a cause for concern? It's the little offenses like the ones mentioned above that took this book down a notch for me. The Ending- I know this was supposed to be climactic but to me it just felt rushed. I was really excited to leave the house and see further than just it or the stream but when we do get "outside" it lasts barely a few pages before were back to just watching and waiting for things to happen. I really wanted Lynn to explore the outside world more and have interactions with other survivors. I also wanted her life to be in actual danger to at least somewhat justify her actions at the end. I don't know...... it just felt deeply unsatisfying. No real danger, no real bloodshed. Sure things are implied but again we never see them actually happening. Some of the events that happen could have and more importantly should have been described in much more graphic detail but for whatever reason the Author chose to keep them what I can best describe as PG-13. The Romance- Lynn and Eli's relationship didn't feel like anything more than a crush. If I didn't feel a connection as a reader then I'm not sure how the characters could feel a connection on paper. While I'm sure Lynn thought Eli was handsome and she no doubt felt a sexual attraction to him on the romance front I just didn't buy it. In fact Eli seemed to be taking advantage of Lynn's obvious naivety especially since he came from the city where women were obviously treated as breeding machines. Now even though I did have quite a few annoyances with this book I did find some things enjoyable. First off, I really enjoyed the relationship Lynn has with the little girl she saves from the stream. The scenes involving those two were probably the most heartfelt since Lynn's emotions felt genuine and she had warmth that was otherwise lacking. Secondly, I liked that the survival skills Lynn uses to survive were pretty much accurate (except eating cold snow for water) and instead of shying away from field dressing an animal they showed it in detail which was nice. Young adult books I find usually skip all that since it's not a pleasant process to read about. This one however tackled it head on and the detail was appreciated. Lastly, I liked the writing style. Sure the dialogue felt a bit clunky at times but overall it was enjoyable. Even though I didn't love Not A Drop To Drink I wouldn't hesitate reading another book by the author should she decide to write one. Overall, while Not A Drop To Drink isn't perfect it was worth my time to read. 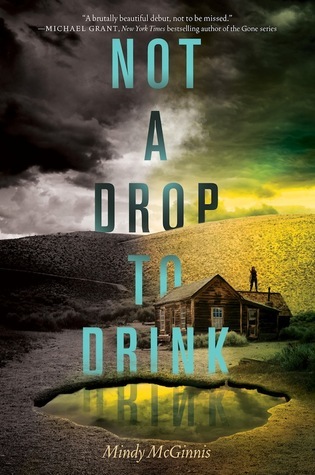 Not A Drop To Drink paints a picture of a bleak world after a global catastrophe interspersed with what it means to live in a time where food, safety and shelter are fleeting. If you like books like The Road, Swan Song or even more young adult fare like Divergent than you'll probably like this book. With that being said, I'll be rating Not A Drop To Drink ★★★. It's good to see that there are a lot of good points to this book, even though it didn't live up to what you expected. Great review Kristin!! 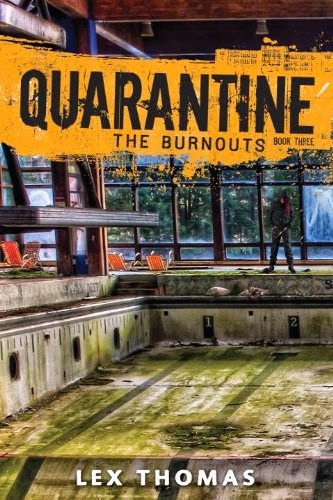 If the book had slowed down a bit and not tried to rush what I felt like an entire series into one book it probably would've been a 5 Star read. Hmm...I hate rushed endings and feeling no romantic connection between characters who are supposed to have fallen for each other. But I've seen this compared to Blood Red Road, which I LOVED, so I'm still going to give it a try soon. Great review! Oh its certainly worth the read. Is this not a series book then? Hmm.. I wasn't sure about this one, but it might be one I would really like. I thought it would be but considering the ending I believe it is a standalone. Thanks! I will probably give it a shot then. This sounds like an interesting read but I don't know how I'd feel about some of the points that you made. I hate when the author puts more focus on things that are trivial instead of important things. I also hate when an ending feels rushed. I'm glad to hear that in the end you still enjoyed the book. Too bad you didn't fall in love with it like you thought you would. I just requested this book, myself. I hadn't heard of it, but it sounds good. I'm even interested to check out the parts that just didn't work so well for you. But I think you did a fantastic job with the review. It's well thought out, clear, and concise - perfect! Oh rushed and dropped bits? The premises sounds really good, but maybe this should be a library book? Great review! I have this book on my Kindle, but for some reason I don't feel as obligated to read it as I had previously. Hmm. Great review!